Clontarf Castle Hotel has recently been given a makeover. The 12th century castle, nestled in a leafy northside suburb of Dublin, has been sensitively refurbished with contemporary, boutique style interiors. They have managed a modern twist on contemporary elegance while managing to retain the classical and historical ambience of this 12th century residence. It is delightful. We settled in to the cosy dining room and perused the menu over a whiskey sour and a gin and tonic. Our waiter was more than happy to help with our wine choices ( 2009 Chateau Laussac Bordeaux and a 2012 Louis Latour Mâcon Lugny) while we set about choosing dishes from a delightfully varied menu. 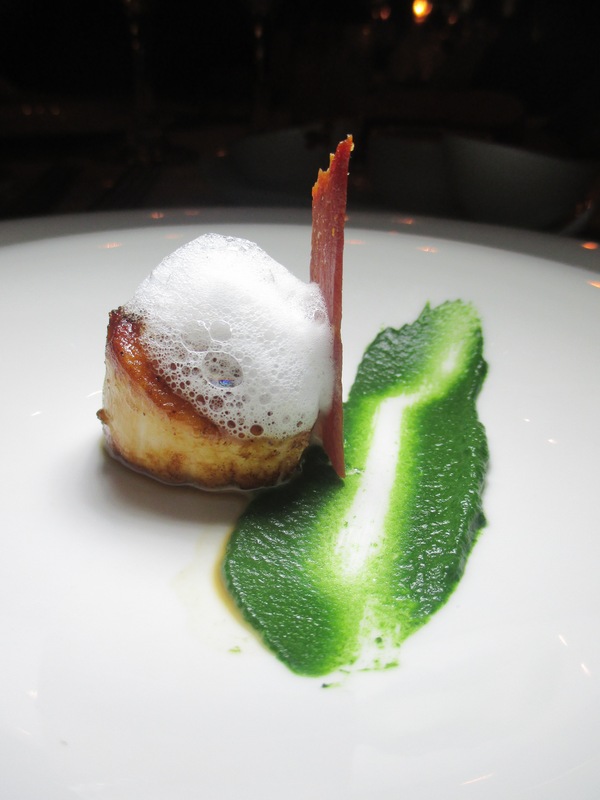 Our amuse bouche of a mini scallop with Parmesan foam set the scene for a most flavoursome evening. 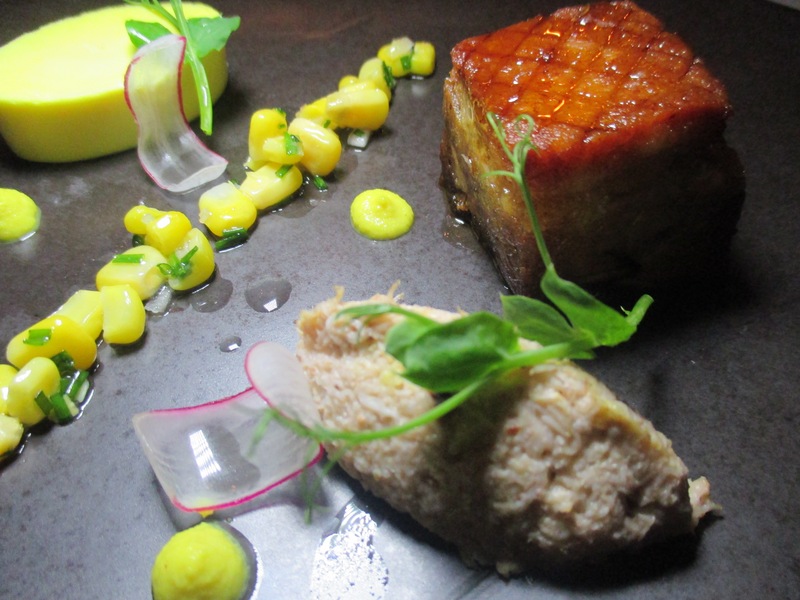 To start, Mr Dillon enjoyed a crispy aromatic pork belly, white crab, sweetcorn panna cotta with a soy dressing. The combinations are inspired – the sweetness of the corn a perfect partner for the pork while the salty crab works splendidly with the panna cotta. I opted for the sherry glazed wood pigeon served with parsnip cream, maple pickled baby onions and baby beets. The pigeon was cooked to perfection and I have to say that I would happily eat that parsnip cream for breakfast, lunch and dinner – this, you must try. For mains himself had the freshest grilled North Atlantic halibut served with winter veg, chicken wings (not like you know them) and a chicken reduction. If you’re a lover of crispy chicken skin, you will love this take on the traditional ‘chicken wing’. I chose the tea smoked duck breast which oozed earthy smokiness and was perfectly cooked. Dauphinoise potatoes and a carrot and anise cream were accompanied by a blackberry jus, and again, the flavours worked together to create another delightful dish. 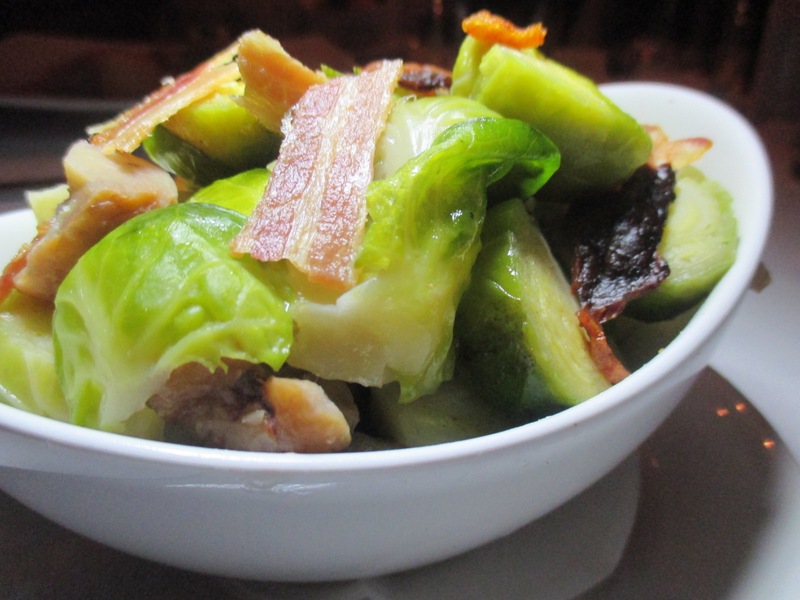 We couldn’t resist sides of local rainbow carrots with honey and truffle butter and perfectly cooked Brussels sprouts with crispy bacon and chestnuts. 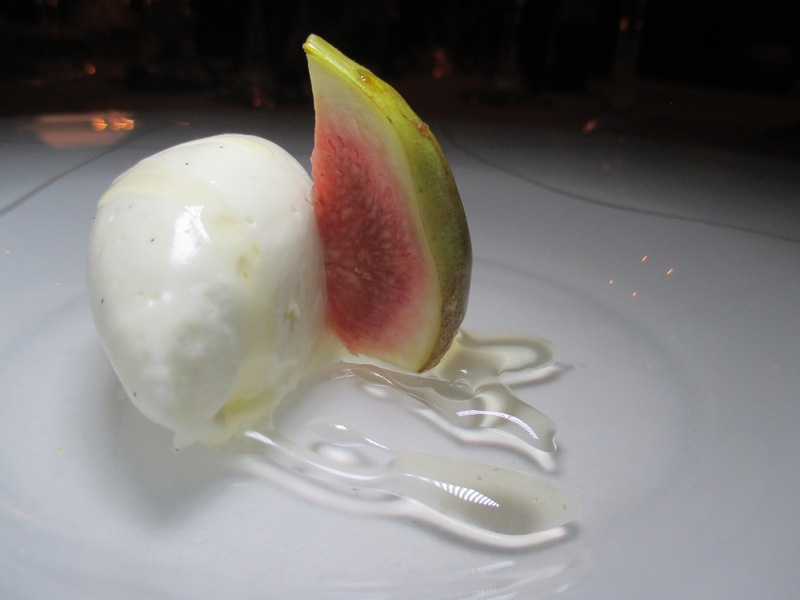 Pre-dessert included honey and figs and then we were on to the sweetest of sweet treats. 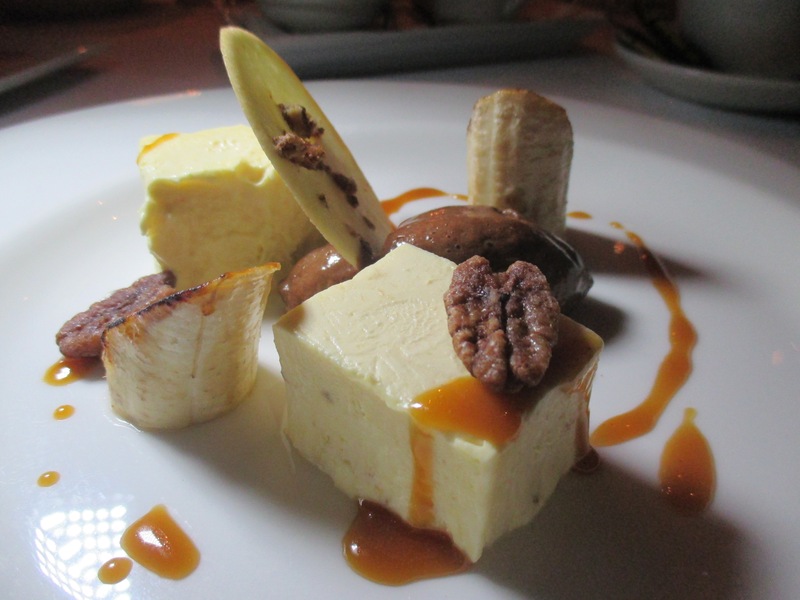 Imagine this – banana parfait, dark chocolate mousse, caramelized banana and a pecan tuile. This dish tastes every bit as good as it looks on the plate. I chose a spiced ginger pudding served with a poached pear and salted caramel ice cream. Once again the flavours complimented each other perfectly. 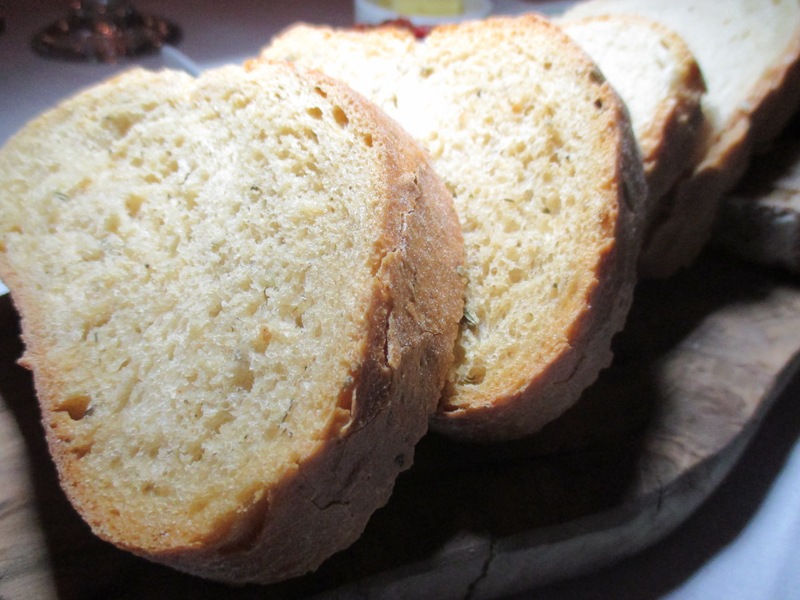 The menu also includes an excellent variety of artisan Irish cheeses served with pear chutney and water biscuits. Over coffee we reflected on what made this menu so delightful. Yes it has great locally sourced ingredients. Yes it is beautifully presented. But what makes this menu really stand out is the flavour and texture combinations. Hot and cold, sweet and salty, smooth and crispy – this menu has it all. 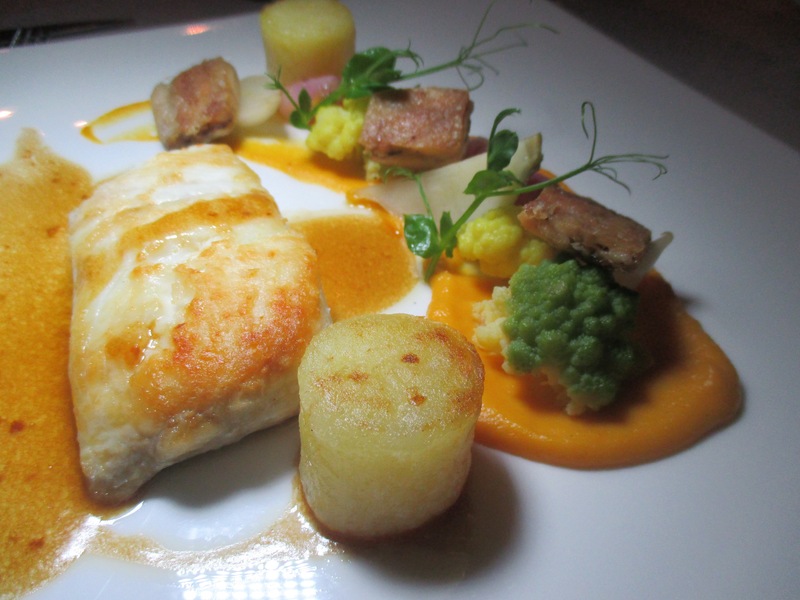 Each dish is interesting, each dish bringing you on a little flavour adventure. 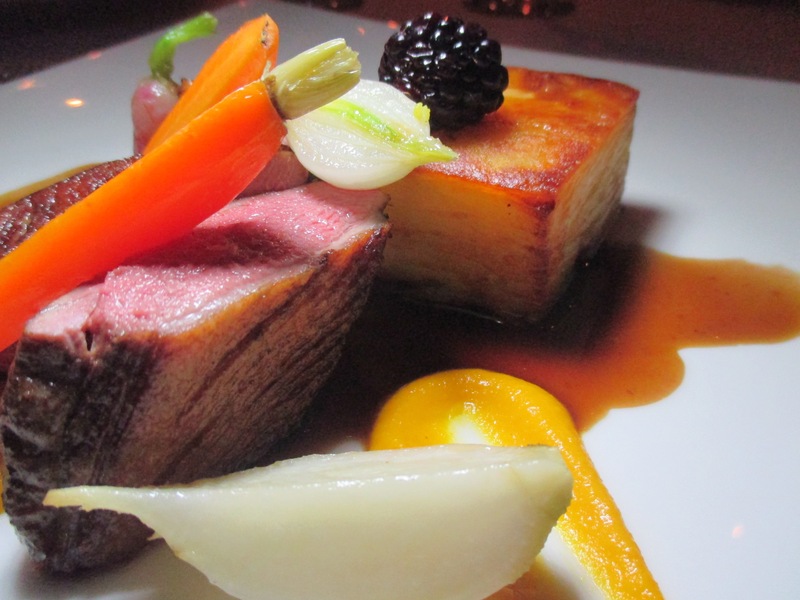 Indeed, chef Stuart takes you on a voyage of flavour combinations that is not to be missed. If you haven’t eaten in Fahrenheit or stayed in Clontarf Castle I recommend you do both. As well as enjoying dishes from the culinary king of the castle, you’ll get to enjoy the wonderful hospitality of all the staff. From the minute you walk through the door of this establishment you will be enveloped in warmth and thoughtfulness. *We ate from the A La Carte menu. Early Bird Menu runs Sunday-Friday until 7pm and is €23.95 for two courses and €27.95 for three courses. 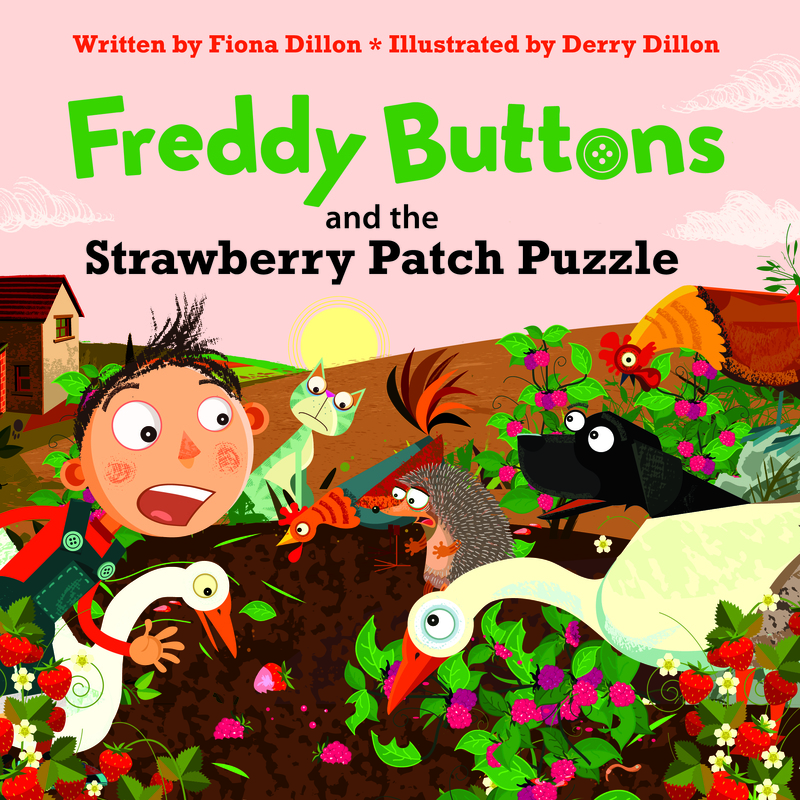 Set menu is €33 for two courses including tea/coffee or €39 for three courses including tea/coffee.